Managed to catch a Juice=Juice talk event on the 24th of August at Kawasaki on my recent trip to Japan. 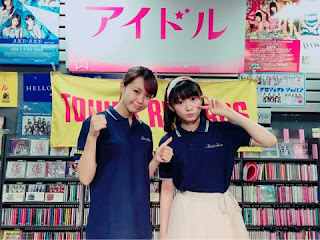 Sayuki and Karin-chan were there to promote their upcoming single 'Dream Road - Kokoro ga Odoridashiteru - / KEEP ON Josho Shiko / Ashita Yaro wa Baka Yaro'. Not willing to preorder something that I couldn't collect, I was stuck behind a crowd of about two hundred people who had preordered. From my vantage point, I could only see Sayuki and Karin-chan's heads, floating above a sea of heads. ♪ Sayuki commented on how quiet the audience was. Karin-chan opined that her fans tend to be the quiet types. Q. As an only child, which Juice=Juice member would Karin-chan like to have as a sister? Karin: Nope, nada, not a single one of them. If I was forced to picked one, I'd pick Uemuu as my younger sister. ♪ For an older sister, Sayuki definitely wouldn't want KanaTomo. By elimination, it'd have to be Yuka then. Q. With videos of their vocal recordings appearing on the Up Front YouTube show 'Upcoming', what was the hardest part of recording their new single? ♪ Karin found 'Keep On Joshi Shiko' difficult because of the MJ-ness - she had add a bit of an extra 'kick' to her singing. ♪ Sayuki agrees that she found 'Keep On Joshi Shiko' difficult as well. They had only a short time to record, and she found difficulties catching the mood of the song. She sang it gently at first, and was instructed to switch styles during the recording - which is why she may have seemed a bit blank during the recording. ♪ They threw out the names of some competitors, like Yoshida and Mizutani. Q. On your days off, do you prefer to stay indoors or go outdoors? Q. Anything that they'd like to do at their Budokan performance? Q. Have they become friends with anyone through the recent Hello! Cons? ♪ No one in particular for Karin-chan. She's been chatting with Wada-san. ♪ Unexpectedly, she's been getting along with Rikako - Rikako's funny, and her reactions are 100 times more exaggerated than normal. ♪ Sayuki's interested in Ogata Risa - her face is Sayuki's type, and she's funny like Rikako. She also has an amazing presence. The girls held a janken challenge with the audience, followed by closing comments. After a short break to set things up, the event ended with a handshake event for those who had made preorders.